Gareth Evans’ The Raid films are two shining stars of modern action cinema, following a special forces cop in Jakarta, Rama, as he beats down wave after wave of attackers in increasingly elaborate action sequences. The movies don’t spend too much time delving into the complexities of the lead character, instead defining him by his steadfast determination and brilliant fighting skills. 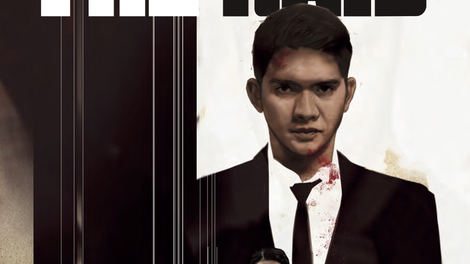 The new comic-book adaptation from Titan Comics has a similar narrative dynamic, filling in the plot of The Raid 2 by exploring Rama’s prison time in greater detail. It does this by introducing a new player, Teja, who trained with Rama and ends up in the same prison after running an unauthorized operation to bring in a notorious crime boss. 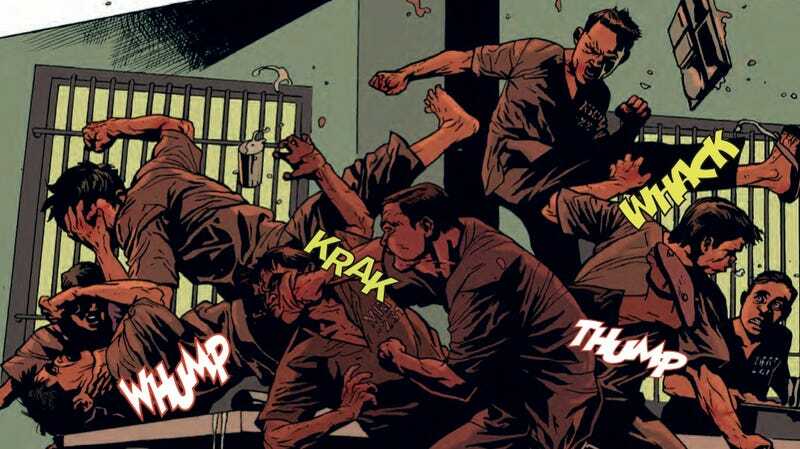 Written by Ollie Masters with art by Budi Setiawan and colorist Brad Simpson, The Raid #1 (Titan) delivers exactly what readers would expect from this franchise: grisly, dynamic action sequences tied together by a story that doesn’t stray too far from crime genre conventions. Masters, whose Vertigo Comics’ miniseries, The Kitchen, is currently in production as a film directed by Andrea Berloff and starring Tiffany Haddish, Melissa McCarthy, and Elisabeth Moss, keeps the dialogue sparse, trusting Setiawan and Simpson to set the tone and establish character basics. Rama’s introduction is a calm, silent page colored with dull greenish gray, emphasizing his cool demeanor and setting a point of contrast for the scene that follows, transporting readers to a nightclub brimming with activity. That nightclub is introduced with two nine-panel grids, creating a distinct rhythm reinforced by panels that alternate between light and dark images. The atmosphere is set with these flashing lights and lines of music that flow across the bottom of each page, amplifying the shift when the action breaks out and drastically alters the page layouts. This change occurs with the introduction of The Assassin, Hammer Girl, and Baseball Bat Man, a debut that blends intensity with humor as Jim Campbell’s lettering warns that they are “Not. To. Be. Fucked. With.” Readers discover why when they attack, a series of actions depicted in three slanted panels that evoke the nine-panel grid from before, but have been forced off their axis by the vicious violence. The layout is completely demolished when the three killers let loose in a page of diagonal panels, colored with vibrant shades of orange, pink, blue, teal, and purple to further energize the action. Setiawan and Simpson’s art is full of strong graphic elements, like a two-page sequence of tall rectangular panels that emphasizes the inmates’ confinement with shadows of prison bars falling over the figures in each image. In a design touch shared by Midnighter, one of the best action comics of the past decade, broken bones are spotlighted with inset x-ray panels, amplifying the force of Setiawan’s fight choreography. The chaos that erupts at the end of this first issue promises that the next three chapters will continue to up the ferocity of these fighters, giving readers more of the thrilling violence that defines the films.